Reading, Pa. – Susan Sullivan has been appointed Penn St. Health St. Joseph’s Vice President of Mission and Ministry. She joins St. Joseph after completing her final assignments in her role with the U.S. Conference of Catholic Bishops in Washington, D.C., where she was the Director of the Education and Outreach Office for the Department of Justice, Peace and Human Development. Sullivan has more than 20 years’ experience developing adult faith-formation resources and collaborative relationships. Her ministry experience includes interfaith and ecumenical groups, boards and committees, parishes and dioceses and marginalized communities, from local to international. She was instrumental in the initiation and development of an on-going national listening process identifying the opportunities and challenges of Hispanic/Latino Catholics regarding social justice ministry and collaboration. 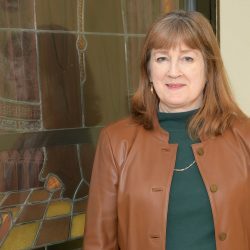 Prior to joining the Conference of Bishops, Sullivan was the Director of Parish and Social Justice Ministries, Catholic Charities, Archdiocese of Atlanta where she was focused on advocating for and educating on Catholic social teachings. She earned her bachelor’s degree from Xavier University, Cincinnati, Ohio and her master’s degree in Theological Studies from Spring Hill College, Mobile, Alabama. Sullivan will also oversee Pastoral Care and Chaplaincy as well as lead the Ethics, Parish Outreach and Mission and Initiatives at St. Joseph.